. : Optics & Photonics Focus :: Superfluid Photons :. Until now cameras have only been able to see what is in front of them. Thanks to recent developments in ultra-fast imaging and computational photography, they may also soon be able to see objects out of the line of sight. Superfluidity is a peculiar quantum state of matter that resembles a liquid, albeit with no viscosity. Usually, this phenomenon is studied at ultra-low temperatures using very delicate setups. However, light can also mimic superfluid behavior, a fact which could make experiments considerably more accessible. Superfluid light. An array of parallel (horizontal) waveguides can mimic a superfluid moving through a pipe with an obstacle at the entrance (green dots, exaggerated in size). The light intensity inside the array of waveguides is shown as rainbow colors (black: no light; yellow: highest intensity). The top panel shows the superfluid motion of light, which keeps its overall shape even after it has passed the obstacle.The bottom panel shows the light moving through the array like a dissipative fluid, for which an obstacle clearly changes the shape of the flow. Picture: Patricio Leboeuf. Back in the 1930s, liquid helium baffled the scientific community. At a few Kelvins above absolute zero, helium behaves like a normal liquid, but, when cooled down sufficiently, it suddenly shows some rather unexpected properties: it can creep up walls, pass through the finest pores and also conduct heat waves, almost as if heat were sound. These remarkable properties are symptomatic of a fascinating, yet very delicate quantum phenomenon, called superfluidity. Usually, superfluidity can only be studied at very low temperatures, and carrying out experiments can, therefore, be extremely challenging. Interestingly, however, photons can also behave like superfluids, even in a setup kept at room temperature, as Patricio Leboeuf and Simon Moulieras from Université Paris Sud, France, have theoretically shown. Unlike normal fluids, superfluids have no viscosity. Viscosity is caused by the friction amongst a liquid’s constituting particles, which produces a resistance to the flow. Honey and chocolate syrup, for example, have a high viscosity; water and alcohol have a low viscosity. Therefore, it is a lot easier to stir a spoon in a jar of water or alcohol than it is to stir it in a jar of honey or chocolate syrup. The more viscous a fluid is, the more energy is lost due to friction between its constituting particles. A superfluid flow does not dissipate any energy, as a consequence of the lack of friction between the constituting particles: therefore, it has no viscosity. Superfluidity was first discovered in 1937 in liquid helium [1-2] at temperatures close to absolute zero. Many experimental observations have been made in the field of superfluids since. For example, superfluids transport heat in the forms of waves, as opposed to through dissipation. Moreover, superfluids have infinite thermal conductivity. Not surprisingly, the great amount of intriguing phenomena related to superfluidity came to thoroughly challenge scientific understanding at the time, so much so that Lev Landau’s theory on superfluidity justifiably earned him the 1962 Nobel Prize in Physics for his "pioneering theories for condensed matter, especially liquid helium." Superfluidity remains an active field of research to this day. It often involves very complex setups, using, for example, ultra-cold gases such as Bose-Einstein Condensates (BEC). The need for such techniques, however, means that experiments on superfluidity remain quite scarce, while the impact of superfluidity research on technology is confined to a highly specialized audience. Leboeuf and Moulieras have found a way to mimic superfluidity without the need for sophisticated cooling mechanisms, by taking advantage of analogies in the description of superfluids and the description of intense light in carefully designed photonic structures. In essence, their proposal is related to a fluid flowing inside a horizontal cylindrical tube. If a fluid is injected into the tube at an angle off the central axis, transversal oscillations up and down the walls of the tube will appear in its flow. By placing a small obstacle close to the entrance of the tube, Leboeuf and Moulieras then studied its effect on the flow of the injected fluid: due to the lack of viscosity, the superfluid flow remains essentially unaffected by the obstacle; in contrast, the flow of a normal fluid shows a rather different pattern,. in which the dissipation of energy is clearly noticeable. Superfluid helium escaping its container. One of the most remarkable manifestations of superfluidity is that superfluid helium can move up the inside walls of a container in a thin film, run down on the outside walls and finally form drops, which help it to escape into the liquid below. 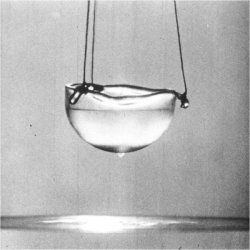 Picture: Alfred Leitner, Superfluid Liquid Helium, 1963. The setup proposed by Leboeuf and Moulieras consists of an array of waveguides. Such waveguides behave like tubes in which photons can flow. In fact, as Leboeuf explains, arrays of waveguides can be used to study a variety of effects. In particular, as a light pulse advances longitudinally, the photons can jump to neighboring guides, so that the light pulse simply spreads out over a large number of waveguides. This phenomenon is not dissimilar to that of spilling a glass of water onto a flat surface and observing that the water spreads out in every direction. To produce a confining potential similar to a pipe, Leboeuf and Moulieras modulate the width of each waveguide; in this way, and by choosing an appropriate pulse shape, the light pulse remains trapped within some of the waveguides and, says Leboeuf, "the light propagates as usual in the longitudinal direction but, in the transverse direction, it oscillates on the well, with its shape unchanged." At this point, the final step is the addition of an obstacle, in order to discriminate between superfluid and dissipative flow. In the case of water flowing in a pipe, the obstacle could be a small stone. In the photonic analogue of superfluidity, the obstacle is produced by a slight variation of the properties of the (central) waveguide at the entrance of the array. 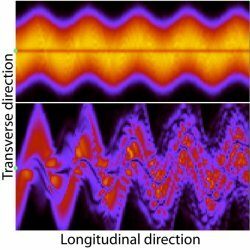 "The optical system carries some distinct advantages over other systems for the experimental study of superfluidity, which might enable new approaches for such studies," agrees Yaov Lahini  from the Weizmann Institute of Science, Israel, while recognizing that some further, subtle points need to be addressed. "In principle, the breakdown of superfluidity might be different in the optical case, as the analogue of temperature and effects such as thermal depletion are not clear here." Nonetheless, comparing the optical setup to ultra-cold atoms, he says that "the advantage of this system over, say, analogue experiments with Bose Einstein Condensate, is the ability to easily control every parameter of the initial wave function and of the confining potential, and the ability to directly measure the spatial profile of the evolution of the wave function inside the potential. As such, the nonlinear optical setup can become a tool with which to study superfluidity in different scenarios, for example in disordered potentials, or in a time-dependent potential. Such scenarios would be more difficult to realize in other systems." Raymond Chiao  from the University of California, Merced (USA), who originally proposed the analogy between superfluidity and photons  has expressed a deep appreciation of Leboeuf and Moulieras’ work. "The conceptual importance," he says, regarding the analogy, "is that it makes a connection between optics and superfluidity, a non-trivial many-body system." He goes on to recognize that, since optics can be done at room temperature, a fact which makes these experiments much easier to perform, "in the future, the quantum aspects of this idea may lead to new discoveries." "These ideas can have an impact on optical science," Lahini concludes. "The conceptual importance," Chiao adds, "is the connection between optics and superfluidity, a non-trivial pursuit many-body system." P. Kapitza, Viscosity of liquid helium below the λ-point, Nature 141, 74 (1938). J. F. Allen & A. D. Misener, Flow of liquid Helium II, Nature 141, 75 (1938). Y. Silberberg, Y. Lahini, Y. Bromberg, E. Small & R. Morandotti. Universal correlations in nonlinear periodic 1D systems, Phys. Rev. Lett. 102, 233904 (2009). E. L. Bolda, R. Y. Chiao & W. H. Zurek, Dissipative optical flow in a nonlinear Fabry-Pérot cavity, Phys. Rev. Lett. 86, 416-419 (2001). R. Y. Chiao & J. Boyce, Bogoliubov dispersion relation and the possibility of superfluidity for weakly interacting photons in a two-dimensional photon fluid, Phys. Rev. A 60, 4114-4121 (1999). Patricio Leboeuf & Simon Moulieras, Superfluid Motion of Light, Physical Review Letters (2010) 105, 163904 (link).